Just like learning doesn’t have to be boring, being entertained doesn’t have to require a TV or wifi. All you need is imagination — and Lunii proves it. Lunii is an audio universe created just for kids on My Fabulous Storyteller. Using this small screenless, EMF radiation-free box, kids can create their own unique audio story in seven different languages. From adventurous epics to soothing nighttime stories to holiday tales, hours of entertainment and learning (without even knowing it) are packed into one little box. 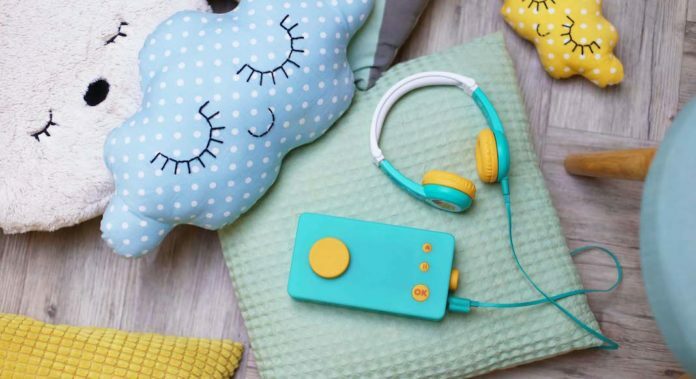 This small start-up was created by four French friends, Maëlle, Igor, Thomas and Éric, with the idea that kids can be creative and learn just by awakening their senses — that’s why it doesn’t have a screen. Listening to engaging stories helps kids to improve their vocabularies and their memories. As a group activity, making and listening to Lunii story develops social skills as they enjoy hearing the adventure together. Barely the size of a paperback book, with rounded edges and just a few buttons, My Fabulous Storyteller is like an 80’s Walkman built for kids. Using a dial, story elements are selected, such as a hero, a location, a second character, and an object. The starter pack of stories that comes with every Lunii device is about two heroes named Suzanne and Ben. By mixing and matching the choices for each story element — Suzanne, the forest, a witch, and a flashlight, or maybe Ben, the sea, a pirate, and a ticket — kids have created their own adventure. All they have to do is press play, and My Fabulous Storyteller will tell them the story they’ve crafted. Just as the audio-only element of Lunii is perfect for encouraging kids to use their imagination, it’s also perfect for kids to work on language skills. Studies show that the best time for kids to be learning a second language is before age 10. Meant for ages three to eight, My Fabulous Storyteller can switch from telling stories in a native language to a second language in just the turn of a dial. Additional story packs in English (UK and US), French, Spanish, German, Italian, Dutch, and Russian are available for purchase and download from the Luniistore. With story packs on the device in multiple languages that kids can switch between, My Fabulous Storyteller is the perfect tool to aid in developing early bilingual skills. The battery lasts for 10 hours — perfect for those long road trips to see families during the holidays. My Fabulous Storyteller can hold up to 10 story packs. Since each pack contains from six to 48 stories, you’ll have more than 100 stories and up to 14 hours of listening time! The starter pack of stories that comes with My Fabulous Storyteller has 3 hours and 30 minutes of exciting adventures. To purchase more content, you just download the Luniistore from the Lunii website. Once you create an account, you can browse the Luniistore and purchase story packs, songs, and educational games. Plug My Fabulous Storyteller into the computer to transfer your purchases from the store to the device.